Enjoyed an exceptional lunch at Cellar Door Provisions this past Saturday - their first weekend open at their new corner storefront at 3025 W Diversey. Cellar Door is another spot that started as underground dining but transitioned to bricks & mortar, and Chicago's the luckier for it. The tartine with house-made kefir, charred onion, and shaved carrots and radish was a thing of beauty (if slightly hard to eat), but it was the smoked beets with sprouted rye and shaved red onion I can't stop thinking about. I also had a lovely, earthy lamb-leg soup with Breslin beans and root vegetables. 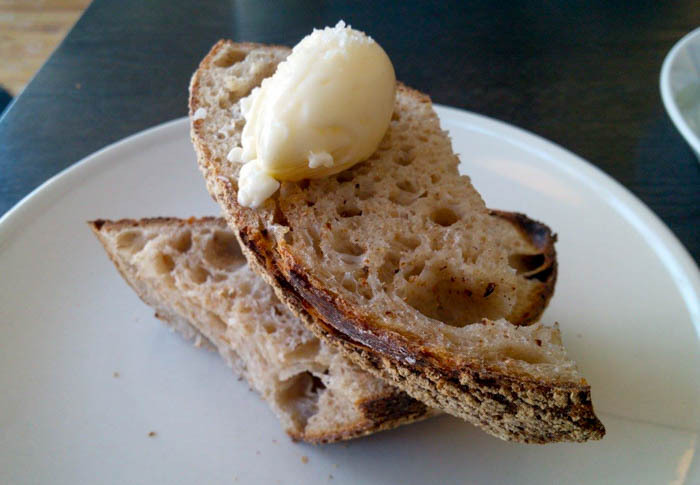 Stunning artisanal bread with house-made butter is well worth the $2. Tony makes the bread on-site and approaches baking with both brain and palate. He has a scientific understanding of yeast, resting, and rising methods, but his culinary verve results in a stunning crust with a nice chew, soft center, and just the right amount of air to give the slice some topography but still hold the butter. Communal tables make for a cheery vibe where you can't help but compare notes with table mates. An open kitchen - about the same the size of the dining area - gives a contagious pulse to the place. Cellar Door joins Fat Rice and Masa Azul along a three-block segment Diversey, making for a lively eats corridor. At the moment Cellar Door is open for breakfast and lunch only, Weds - Sat. They'll do one Sunday prix fixe dinner a month, with a vegetarian option available. They're still playing around with their hours, so it's probably worth checking ahead. I had the opportunity to taste one of the croissants fresh out of the oven when they were still testing them a few months ago and they were truly amazing. Can't wait to try the canelés. Glad to hear early positive feedback about Cellar Door Provisions. I had a really enjoyable underground dinner at Justin Behlke's Thurk (one of the Cellar Door owners) and he is such a warm, friendly person in addition to being very talented. I am really hoping they are a big success. I need to make it here soon. I had lunch here last week. The farmer's cheese dumplings were so delicious, like a creamy gooey gnocchi. I also had the bostock, which had wonderful soft and chewy bits and then crispy caramel-like edges, and the canele, which had a wonderful perfume-like flavor from wild bay. I'd be hard pressed to think of the last time I had better bread. House made bread, butter, mustard. Cellar Door Provisions, count me a fan! I wish this place was easier to get to. It's open for lunch, but just getting there on transit would eat up my entire lunch hour- 30 mins there and 30 mins back. I spent a good 4 hours yesterday at Cellar Door Provisions, and ended up having both breakfast and lunch. Was there to meet with a colleague and get some work done, and ... well, the staff was so welcoming and the food so great, I ended up using the gorgeous space as my personal office for the day. As Gary says, the bread is fantastic. The menu itself is quite limited, with the bread making appearances throughout. But not limited in a bad way, just very specific and hyperseasonal. I had some sort of charred ramp / shisho leaf / whey concoction over heavily charred (as in freakin' awesomely and aggressively charred) bread and a decadent bone marrow and nettle quiche to start. Shared that with my pal. Brewed coffee is fantastic -- didn't miss lack of espresso options. For lunch I had a wild onion soup (fantastically charred ramps again) with a perfectly poached egg and wonderfully simple and bright duck broth. To reiterate: staff here is helpful and super duper friendly ... almost in that "are you about to try to recruit me into a cult" sort of way, but without the creepy. I took home a giant loaf of bread and the wife woke me up this morning yelling, "THIS BREAD IS SEXIST." Understandably confused I stumbled out of bed to a bit of a bread knife massacre in the kitchen: a spray of crumbs and crust shards desecrated our poor kitchen, which I had so meticulously cleaned the night before. Now, we do not subscribe to traditional gender roles in our relationship and I can say from experience that this particular woman is quite strong and tenacious, but this bread has one of the thickest and most resilient crusts I've ever seen. I don't want to say it's a "man's job" to cut it because that would be mostly inaccurate, and I don't think we can ascribe bigotry to bread ... but I am lucky to eat such fantastic bread and have such a funny partner. Can't wait to go back. Go here. It was unconscionably deserted on a gorgeous Thursday afternoon. Please keep this place alive. It didn't seem struggling but this is the sort of place where there's a line and you gladly wait. Cellar Door Provisions convinces me that there's a bread and pastry renaissance taking place in Chicago these days, and it's about time. 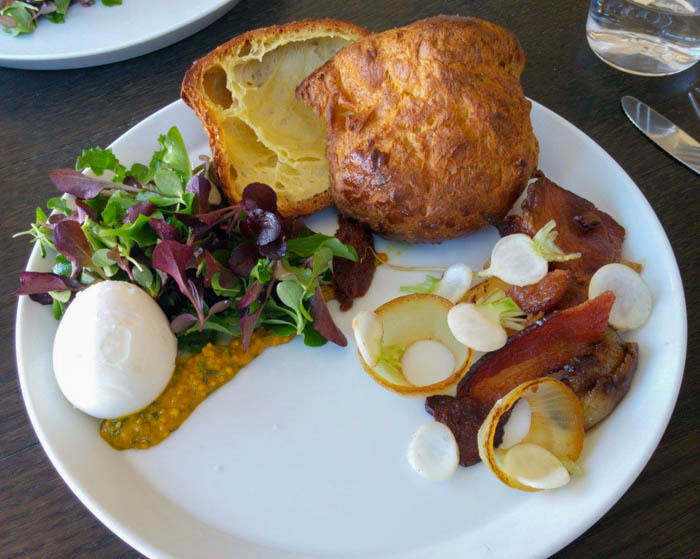 But even if my first visit to Cellar Door focused exclusively on bread and pastries, glimpses of other items -- perfectly poached eggs, housemade merguez sausage and stunning quiches -- will ensure that I return to explore the full menu at some point. The croissant was gorgeous. 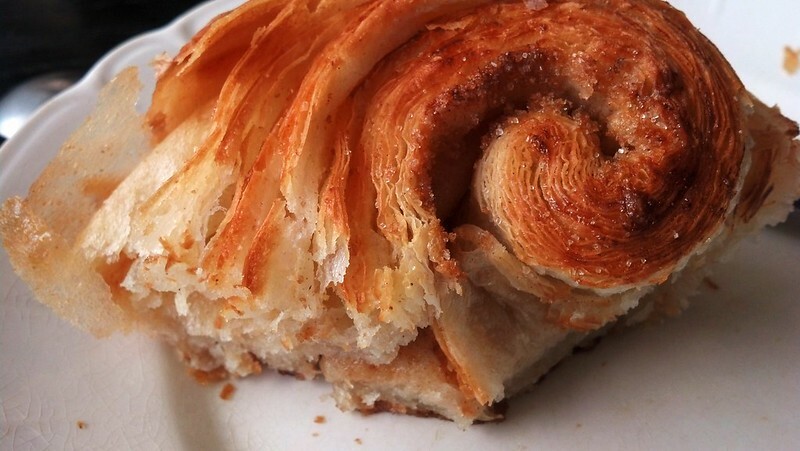 One thing that immediately sets Cellar Door apart from most croissant makers in Chicago is that they not only make them completely from scratch, but they also use their own house-churned butter made from Kilgus cream. Cellar Door's owner/head baker attributed some of his croissant-baking success to having observed croissants being made at Beurrage in Pilsen. 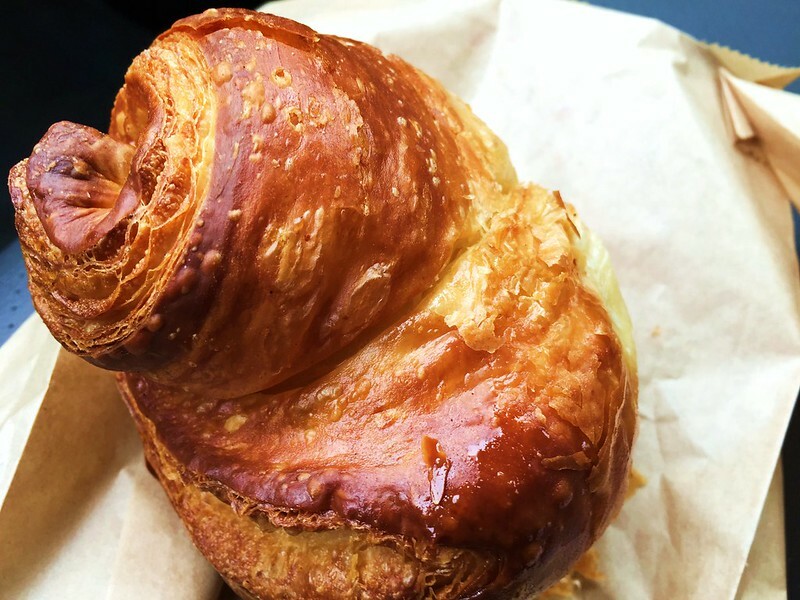 I suppose that means I'll have to visit Beurrage, but for now I'll declare Cellar Door's croissant to be the best I've ever tasted in Chicago, and the competition is not even close. Though the croissant was slightly underbaked -- I suspect an oven running a little hot since the exterior was perfect -- it was still extraordinary. Crisp and flaky exterior, light interior and very buttery. I've had some excellent croissants in Chicago, including the terrific ones at Bad Wolf, but none have come close to this one. The pain au chocolat was no less stunning. Crisp and flaky, light and tender, and melted chocolate well distributed throughout. It was easily the best pain au chocolat I've had in Chicago. And again, no close second. I also loved the morning bun. It's also made from the croissant dough, but incorporates cinnamon and sugar. 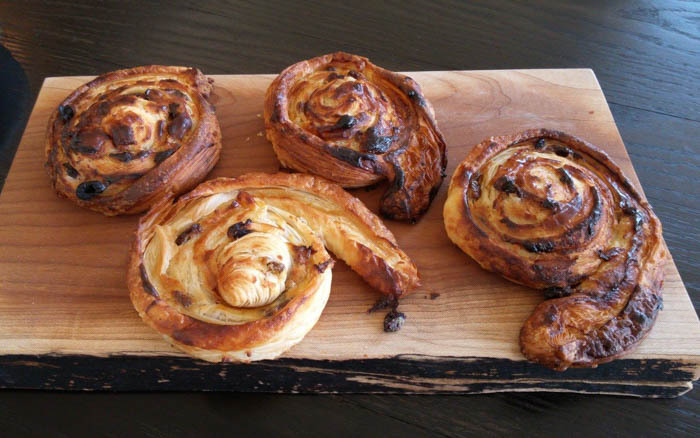 It's not a kouign amann, so don't expect that same level of crispness and density. But it's still crisp and flaky, light and tender and buttery, and absolutely delicious. It was pretty much on par with the croissant and pain au chocolat for me. And though I enjoyed the canele, it was not in the same league as Bad Wolf's. The exterior is slightly less dark, particularly on top towards the middle, and the exterior a little less hardened. While delicious and custardy, it lacks the depth of flavor of the caneles from Bad Wolf. I also brought home a loaf of their sourdough bread. Funny how the loaves sit close to the Tartine cookbook, and they reminded me of the Tartine country bread. Most importantly, crisp exterior, great texture and fantastic flavor. This is the type of bread that ruins meals since you just cannot stop eating it. I'm thrilled to have made my acquaintance with Cellar Door. I expect this will be a long lasting friendship. We went here for lunch yesterday, and it was awesome. Bread/butter was as good as it gets. However, portions are small. My wife is a light eater and she was even still hungry after having the quiche. I had the sausage, and it was great but it was actually a half sized sausage. I would recommend if you want a lunch-sized portion get 2 of the "dishes" per person. Unfortunately, that makes this place fairly expensive. Cellar Door is not cheap, but I don't believe it's at all expensive for what they deliver. Unfortunately, we've all become accustomed to certain prices for meals made from lesser quality and less sustainable food items. So while I agree that the meals did not look huge (though to me, they looked quite filling, including a hefty slice of quiche), I did not feel like anything was unreasonably high priced. And an easy way to fill up would be to indulge in some of their fantastic bread/pastries. Absolutely the best bread I've ever eaten. Brought home a loaf and couldn't stop eating it. The food was wonderful too. Can't wait to return. Finally made it in to Cellar Door Provisions and already am planning a return trip soon; it was outstanding. Agree with what most have been saying; the bread is among the best I have had (I was hoping to try a croissant but they were already sold out; I opted for a whole what scone that was just phenomenal). I also ordered the stinging nettle pasta with asparagus, carrots and sorrel that also was delicious. 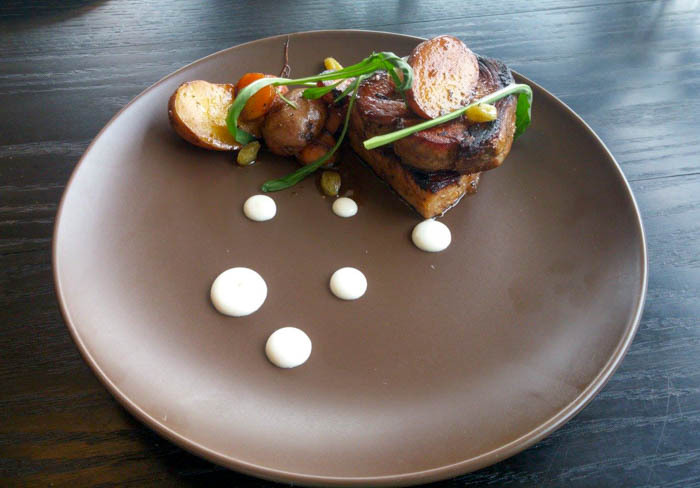 The menu is limited and portions are on the smaller side; but the quality, creativity and execution are high and the bread is not to be missed; an entree when combined with pastry/bread is filling for a breakfast or lunch and a very reasonable value. Definitely one of the more interesting breakfast and lunch places around. Such a friendly group of people behind Cellar Door Provisions; was glad to see them busy and receiving largely very favorable comments. Look forward to trying more of what they have to offer very soon. Stopped by for the first time yesterday and had the green garlic soup, served with 2 slices of bread. Soup was a wonderful, more delicately seasoned than the version at Publican Quality Meats, but at $11 it also cost around 50% more and it's my understanding that PQM similarly sources high quality produce and ingredients. Was looking forward to taking home a loaf of the bread but they were already sold out for the day. I love that they often use organic ingredients and I'll return for lunch with family in tow. But be warned that lunch servings are small and I could have eaten both the featured buckwheat crepe with goat and the green garlic soup and I would have left pleasantly satisfied (although that would have been a $25 lunch). I think pastries are quite reasonably priced but it would be difficult for me to agree with the sentiment that CDP is a good value as a lunch destination. With a pastry and glass of tap water, my tiny lunch was $16. A local resident walked in with bright curiosity and looked at the menu and left -- I really wish that high quality food was more affordable. Based on reviews here, I decided to swing by CDP on late Sunday morning as I was somewhat in the area. I went with the morning bun and pain au chocolat to go, with some sliced bread and butter there. The bread and butter was certainly excellent, but it was the two pastries that were the highlight for me; the best that I've had in a long time. I used to have the almond croissant from Vanille as my favorite croissant product in Chicago, but both of these have now surpassed it. I prefer sweet flavorings with my croissant, so I'll probably never go with the plain one, but I can certainly see how that would be the favorite item of others. They're not priced to sell by the dozen for the office or home brunch, but they are certainly worth it as individual special treats every now and then. Stopped by for my first time and picked up a kougin amann and a loaf of bread to go (they did not have any croissants yet). I couldn't resist eating the kouign amann in the car, and made an absolute mess of myself. When I got out of the car, my shirt was covered with flakes. I finished that pastry in nearly no time at all and instantly regretted not ordered multiples. This was one perfect pastry - it was my first of its kind and can see how I may never order any other pastry in the future. I tore into the bread when I got home, and my disappointment about not having another pastry ALMOST disappeared. Amazing bread, as clearly documented everywhere else, simply adorned with butter. Cellar Door is now making laminated brioche, yesterday one with olive oil and salt. I don't believe they've quite perfected the lightness, but it was still terrific. Their cannelés are getting better and better too -- not quite Bad Wolf great, but still excellent. If you couldn't tell, I love this place! We had a phenomenal breakfast this morning at Cellar Door Provisions. Started with a cannelé and morning bun, and both pastries were spot on. No surprises there. But then we shared a few breakfast entrees, the onion confit quiche and the "Staff Meal." Far from your typical scrambled eggs in a pie crust, CDP's quiche was the very best I've ever enjoyed. Beautiful, buttery, impeccable crust and a rich and creamy, but somehow still light custard. Wow. Game changing. The "Staff Meal" was just a perfectly soft-boiled egg, two thick slices of their exceptional bread with a big ol' lump of salted butter, and some lightly dressed salad greens. So simple, yet so very satisfying and delicious. CDP has way more going for it than the amazing pastry. I'm going to have to make it back in soon to see what they have going on for lunch. 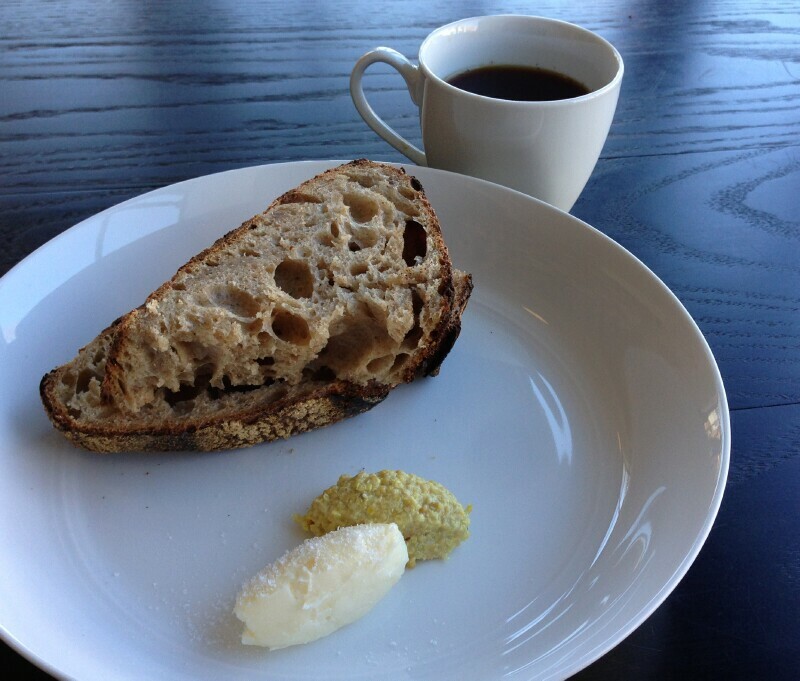 RAB wrote: We had a phenomenal breakfast this morning at Cellar Door Provisions. Started with a cannelé and morning bun, and both pastries were spot on. No surprises there. But then we shared a few breakfast entrees, the onion confit quiche and the "Staff Meal." Far from your typical scrambled eggs in a pie crust, CDP's quiche was the very best I've ever enjoyed. Beautiful, buttery, impeccable crust and a rich and creamy, but somehow still light custard. Wow. Game changing. Darn it! I missed you. 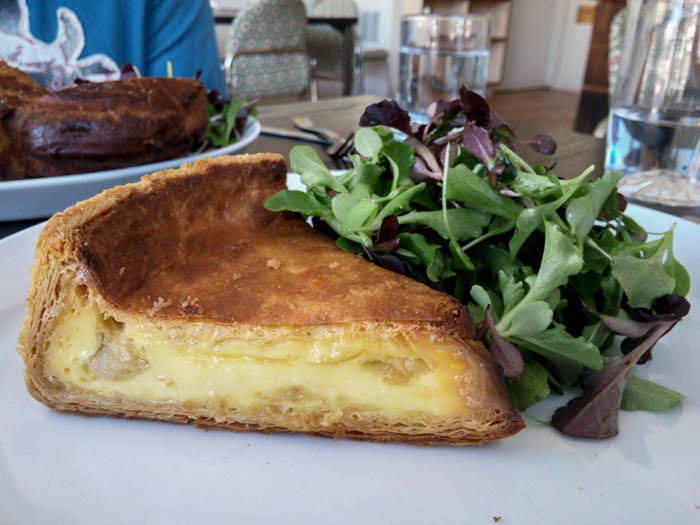 RAB wrote: Far from your typical scrambled eggs in a pie crust, CDP's quiche was the very best I've ever enjoyed. Beautiful, buttery, impeccable crust and a rich and creamy, but somehow still light custard. Wow. Game changing. That quiche looks so light, it appears to be floating in air...upside down. ETA: The picture, which was once upside down, has been fixed, making this post into utter nonsense. RAB wrote: ...CDP's quiche was the very best I've ever enjoyed. Yep: the only one I've ever eaten that I'd come back to get again. Excellent. It looks very similar to a Lindy's cheesecake I made recently. FOr Lindy's, it begins in a very hot oven for the initial 15 minute bake, then it is turned down very low for the remainder. They make it more like a custard. Winchester does as well. The restaurant is now offering preorders for a loaf of bread a day in advance. They were unable to keep up with demand for walk-ins and for the bread needed for service. It is now unlikely you will be able to just walk in and buy a loaf of bread if you have not preordered it - at least on the weekends in any rate. This has been a bread service announcement. I met up with Gastro Gnome for my maiden voyage to Cellar Door Provisions yesterday. As everyone has said, Cellar Door Provisions is operating at a very high level. As soon as you walk in the front door, your nose is assaulted by the smell of butter in the air, and that's a smell that can only mean good things are to come. While everything I tried was very good, the laminated dough products seem to be the star of the show (at least for me). I can easily accept the new Burt's Pizza-like rules on ordering bread ahead of time as long as they keep cranking out those delicious pastries on a regular basis. This was Gastro Gnome's breakfast, and the only thing I didn't get to try. It looked very good, though. Maybe Gastro Gnome can comment. Very good, as scones go. Not dry at all and a nicely balanced flavor profile. Not overly sweet, either. Crispy and caramally on the outside, soft and custardy on the inside. If it weren't for Bad Wolf, this would easily be the best version in town. This was the star of the show. Served still warm, the taste of butter permeates the many visible layers. 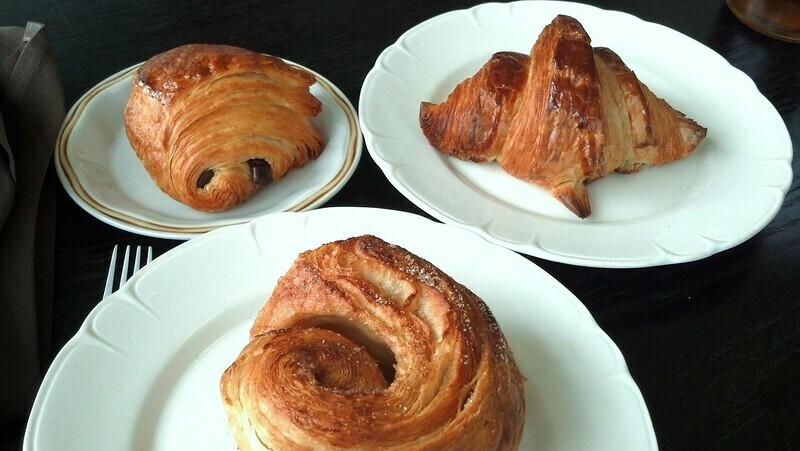 Their croissants are as pretty to look at as they are good to eat. No butter, jelly or other accouterments required. I found the canele and the croissant to be excellent (as usual) and the scone to be good. The porridge was fine. It was a bit underseasoned and could have used something with a little zip. But it everything was cooked properly and it was a filling and good start to my day. I am always tempted to try some of their changing offerings, but next time I may go back to the always excellent quiche or staff meal. Or veer lunchwards. I'm lucky to have this place right around the corner. It's legit. The best, most delicate and buttery French pastry I've ever had. Best quiche I've ever had. They can be a little precious about their offerings (the gentleman at the counter almost had a heart attack when I asked him to slice my loaf of bread...no I wasn't going to serve it all right away...yes, I am putting the rest in the freezer because I only have one stomach). But it's all in the spirit of wanting to serve you good food. I'd had their bread before, of which I am a big fan but a visit this morning, mostly for pastries, was a mixed bag. As was posted above by RAB, the quiche was a stellar rendition. I loved it and cannot remember ever having a better one. I'd order it again in a heartbeat. In fact, I'd make a special trip for it. The canele had great flavor but the exterior was not quite as sturdy as I am used to (or prefer). Another small round cake, dusted with powdered sugar (I cannot remember what it was called), was buttery and sweet but pretty dry and crumbly inside. 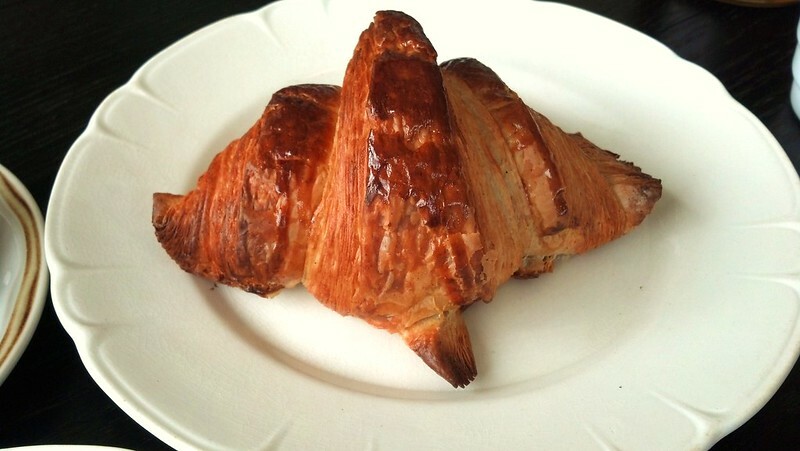 Croissant was beautiful and unusually large, and the tips were delicious but much of the interior, especially near the middle, was virtually uncooked. It was a serious miss. Had we been eating in, I would have certainly let someone there know about it. Service was excellent and the vibe was friendly. The space, while small, doesn't feel crowded or cramped. It's laid out nicely. While we waited for our order we saw some beautiful, delicious looking plates being served -- just gorgeous compositions. I look forward to trying some of their composed dishes -- and that quiche again -- in the very near future. ronnie_suburban wrote: I'd had their bread before, of which I am a big fan but a visit this morning, mostly for pastries, was a mixed bag. As was posted above by RAB, the quiche was a stellar rendition. I loved it and cannot remember ever having a better one. I'd order it again in a heartbeat. In fact, I'd make a special trip for it. 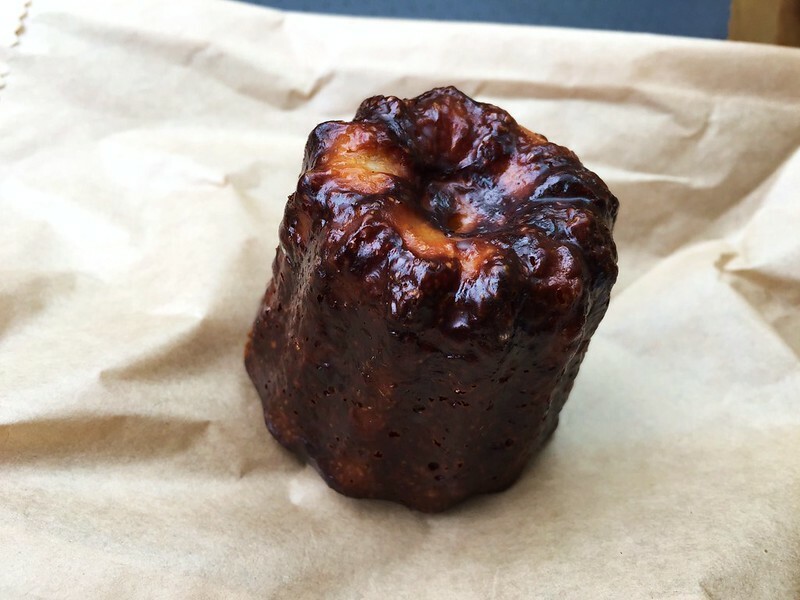 Your experience with the croissant and canelé is fortunately (for everyone but you at the moment) rare. I'm a relatively frequent visitor to Cellar Door for their wonderful sourdough bread and their pastries. And while my croissants are usually perfect, I have had an undercooked one or two that were slightly doughy in the middle (but not to the point I'd call it less than a bit doughy). And though their canelés have gotten better and better, one I picked up from them a week or so ago was falling apart because it was just too wet in the interior. On another occasion, I was seriously annoyed that they sold a friend of mine a chocolate croissant that was obviously burnt on the outside . . . had I noticed when they took it out of the case, I would have said something and my friend didn't want to make an issue out of it. But I wouldn't keep going back as often as I do if I wasn't blown away by their bread, croissants and other pastries (particularly, the French pastries) on the overwhelming majority of my visits. Cellar Door (and Beurrage for that matter) are simply offering breads and pastries not previously seen in Chicago in terms of this level of quality. And if Craft Pizza had expanded pastry hours, I think people would realize they're pastries are worth oohing and ahhing about too. I met some LTH'ers over the weekend for the very end of brunch service. We were able to sample much of the menu. They were unexpectedly slammed (probably due to the suddenly nice weather) and put up a sign that they were out of food by 1:30 PM. Luckily, mhl got there early, cleaned them out of pastries and explained that he was expecting a group to show up and the staff agreed to make us lunch with whatever they still had on hand. Thanks again mhl! The raisin pastry we sampled was very good. I was worried the pecan tart was going to be overly sweet (it resembled the color of pecan pie), but it actually seemed to be based on condensed milk rather than straight sugar so it was not saccharine and tasted more of caramel. I've found their batting average for pastries to be extremely high. Part of my motivation for scheduling lunch is that I have not tried too many of their savory creations. The quiche was as delicious and custard-y as ever. The bread and butter also nailed it. 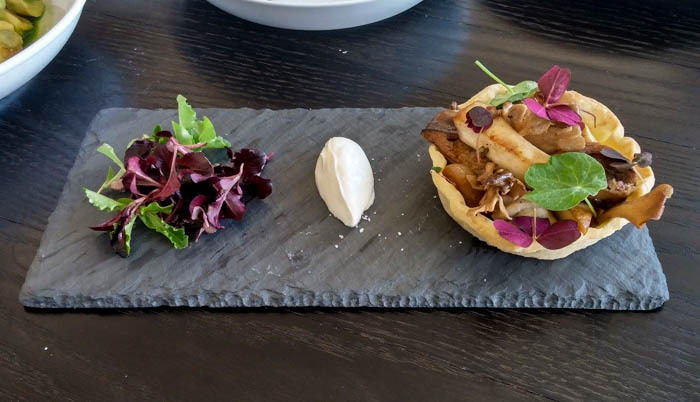 Of the other savory items we tried, my favorite was the mushroom tart. It featured a few types of either sauteed or roasted mushrooms in a pastry shell (I think oyster and at least one other). They were seasoned well and the cooking brought out their umami. 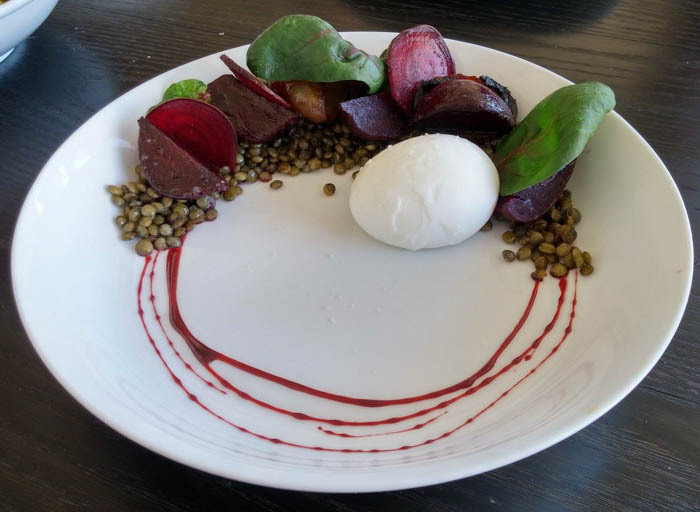 A dish of lightly dressed lentils with beets and a poached egg was maybe the prettiest plate of food I've seen them put out (and that's saying something). They were firm (probably du Puy) lentils and were perfectly cooked. 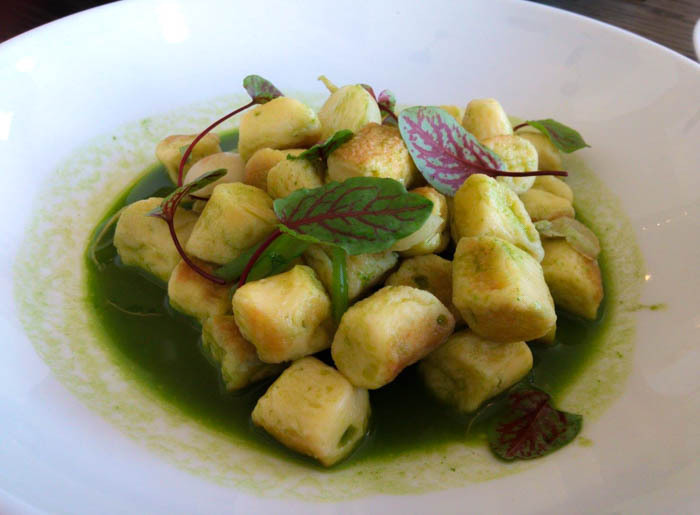 Gnocchi in an parsley and cilantro broth was fine, but nothing special. The staff meal was simple, but allowed us to indulge in more egg and bread. As someone remarked, "this was the perfect brunch." The food here is not complicated, but they source and prepare things well. I will remark (as BR has elsewhere) that the loaf of bread I took home was burnt in places. Most of the bread is fine (and the bread we were served at the restaurant was faultless). The natural starter tang is still great, but I'll make sure I get a look at the next one before I bring it home. Thanks for the company for lunch. I'm still very happy to have this place close by. The GNR conversation is what finally got me into Cellar Door about a month ago, and I've already been back 3 more times. I wasn't a huge pastry guy, but CDP is slowly but surely converting me. It is a real game changer when it comes to baked goods. I'm mostly writing this as a service to offer some visual inspiration regarding what stuff they serve other than awesome pastries, which I'm surprised this thread is severely lacking! The daily meals really are as thoughtfully concocted as the pastries. Each and every sliver of radish or micro green meticulously placed on the plate. The food has all been outstanding, and the prices are also very reasonable to boot. Here are some cell phone pics. I guess the days are gone when one might apologize for that.